There's no place like Glacier Bay on earth! 3.2 million acres of forest, inlet and shore, 15,000 ft mountains. Get the answers to your questions here! 1. Why does the ice look blue? reflect back through the ice to your eyes. 2. Does the bay freeze in the winter? No, the combination of wind, tidal fluctuation, and moderate maritime temperatures keep the bay from freezing over. 3. Can anybody bring a ship in here? Any vessel is welcome to visit Glacier Bay. To protect park resources and enhance visitor experiences, the National Park Service limits the number of vessels during the summer months. Two cruise ships may enter each day. 4. Where are the whales? Humpback whales are most often seen in the lower portion of Glacier Bay, frequently close to shore. Look for their “spouts” hanging in the air; and remember, even whales can look small from a distance. 5. How high is the face of Margerie Glacier? 100 feet below sea level. 6. Why is the Grand Pacific Glacier so dirty? Avalanches, rock slides, tributary glaciers and the scouring of the valley have caused an accumulation of dirt and rock. 7. How deep is Glacier Bay? Very deep! It was carved out by a glacier and filled in with saltwater as the glacier retreated, creating a fjord. Much of the bay is over 1,000 feet deep. 8. What are the chances of seeing the glacier calve? Fairly good. These glaciers can move over five feet a day! Calving usually occurs a few times an hour from tidewater glaciers. 9. What’s the weather like here? It rains a lot — 70 inches a year near park headquarters. May and June are the sunniest, and it is usually not as cloudy near the glaciers as in the lower portion of the bay. The constantly changing moods and quality of the light are part of Glacier Bay National Park’s scenic splendor. 10. Is climate change affecting Glacier Bay’s glaciers? Scientists who observe Earth’s climate have documented warming temperatures in Alaska. Of the more than 100,000 glaciers in the state, 95% are currently thinning, stagnating, or retreating, and Glacier Bay’s glaciers follow this trend. However, due to heavy snowfall in the soaring Fairweather Mountains, Glacier Bay remains home to a few healthy and advancing glaciers, a rarity in today’s world. 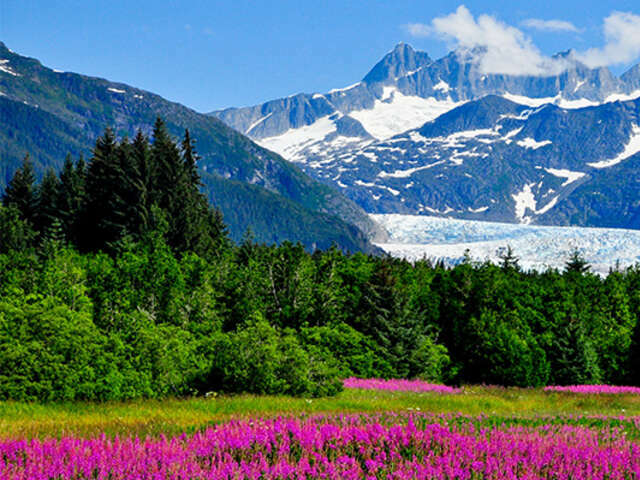 Contact your UNIGLOBE Travel Consultant today for great Alaska Cruise Deals!